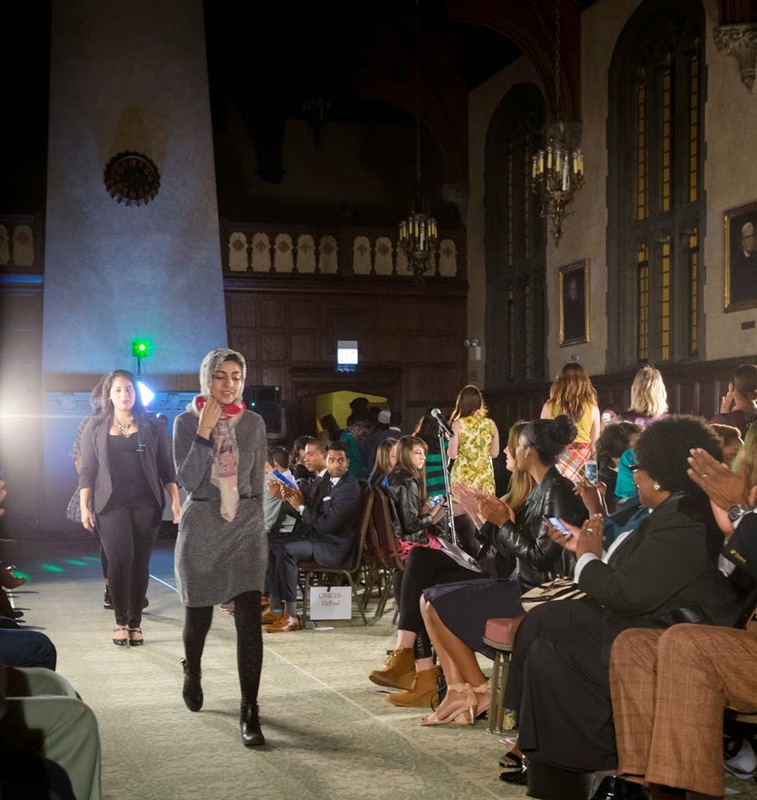 Last Sunday I was given the honor of working with the UNICEF-DePaul University Chapter to act as the Fashion Director for their 3rd annual For The Sake of Fashion benefit runway show! 100% of the proceeds from this event went towards the U.S. Fund for UNICEF, and of course, all of the clothing was sourced from socially-responsible boutiques and designers. We had the honor of showcasing 5 very talented and beautiful brands: Le Dessein, Mata Traders, CLEON's Clothing, One Find Duo, and Anastasia Chatzka, each of which not only so generously loaned me their clothing in order to make the show possible, but they also are leading the way for a brighter, more responsible fashion industry. 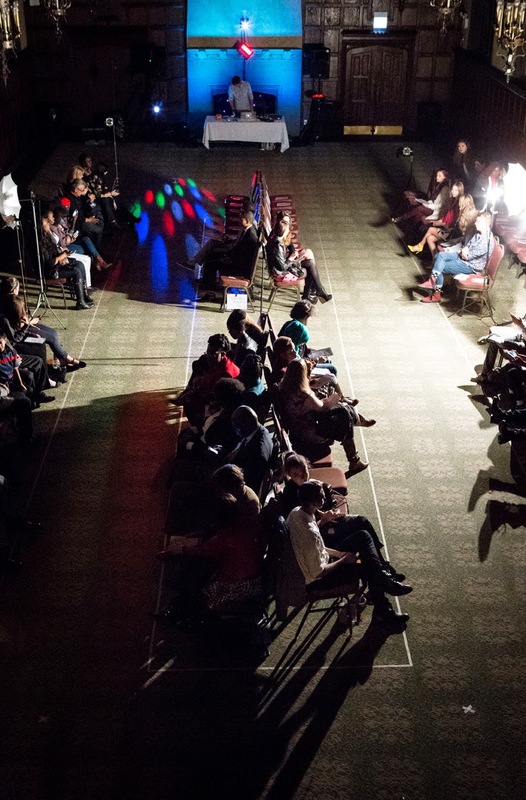 Below are a few select snapshots Alex took pre-show followed by complete sets of looks by the designers on the runway. Because of the (basically) endless number of photos she took, the rest of the photos will be posted on le Facebook Page, so as to not overwhelm you with photos (and secretly encourage you to "like" ze page!). Also the post-show photos look like holiday cards (who knew a bunch of Muslims would make great Christmas cards! Feel free to send to your relatives) which is handy. So you probably want to check those out, here. Le Dessein | Elegant, sophisticated, classy. Le Dessein works to fund the education of young girls from underprivileged backgrounds--each of the portraits that you see chastised on to the clothing are done by the girls, who are then supported through purchases from the clothing. An incredibly beautiful brand, inside and out! Mata Traders | As an avid pattern-clasher myself, the bright and fun prints (block-printed by hand with eco-friendly dyes!) were rather eye-catching and flattering on all body types. Not to mention that Mata Traders has a strict, fair-trade-only policy, working with women from cooperatives in India and Nepal that also provide not only fair wages and training, but also family services and literacy classes! 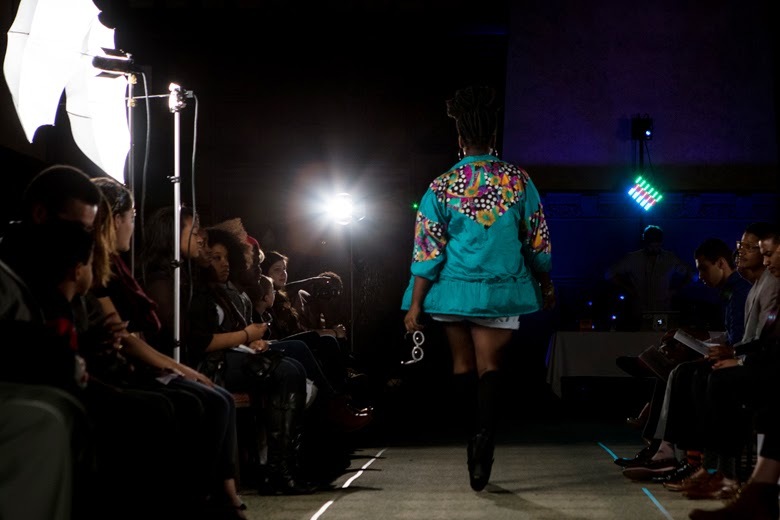 CLEON'S Clothing | Started in 2005, CLEON's is a local Chicago brand constructed entirely by the hands of local designer Chad, and continues to be entirely a rather impressive one-man show that carries both cutting-edge (literally) mens and womenswear that make a powerful image. One Find Duo | Young, playful, edgy. 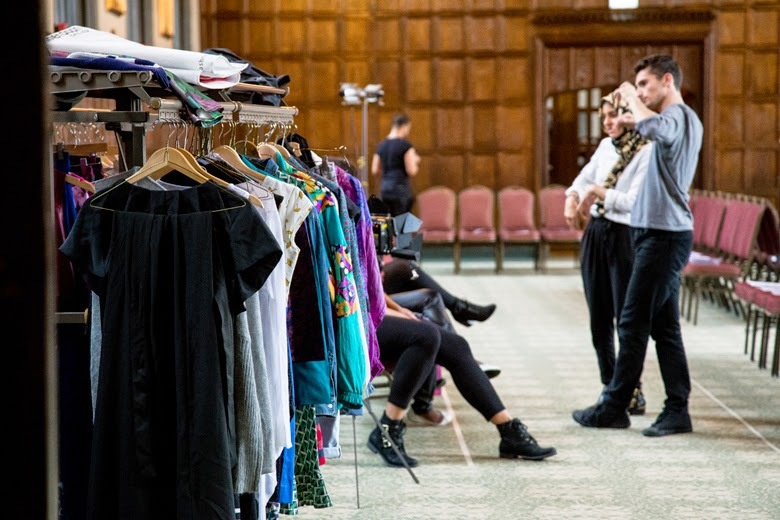 Based in Chicago and only a few years old, One Find Duo is a curatorial vintage re-sale store that partners with local non-profit organizations that empowers and encourages youth in the South Side of Chicago to become strong and charitable leaders. Not to mention that their vintage patterned windbreakers are basically the best thing ever. Anastasia Chatzka | Feminine, bold, colorful. Another local designer in Chicago, Anastasia is brilliant when it comes to the mix of textures and fabrics and color. She also is incredibly conscious when it comes to the fashion industry's "fast fashion" trend of excess waste and production, striving to bring morals and authenticity to her line by working with highly skilled artisans and not turning towards exploitative labor to create her art. 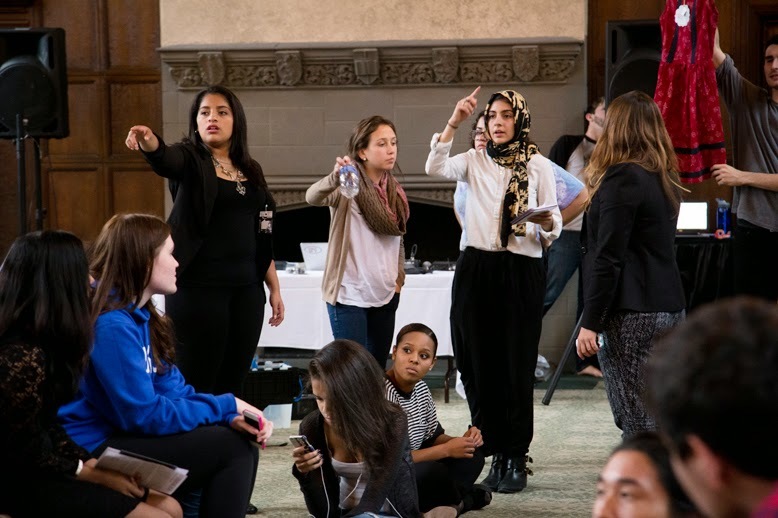 Again, thank you so much to Joseph and the DePaul University UNICEF Chapter for allowing me to be a part of this amazing event! Show them support by checking out their Facebook Page here where you can also see more photos of the show from other photographers, and JooJoo Azad's Facebook Page here where you can see the rest of the photos taken by Alex! (Including a few awkward photos of myself pretending like I can do public speaking) (and those holiday cards I mentioned) (coming soon tonight)! Thanks for sharing the photos from the event! I was really curious to see them! The brands and designers based in Chicago are really cool and now I know about their existence! Thanks once again! I'll check the other photos on FB as well. woaaah, congrats earning the fashion director gig, that's amazing! and all these looks are so wonderful- and that first photo you took of the teal dress is just stunning. it looks so dramatic and ball-esque. this sounds like a super fun event! (: Thank you! What is fashion without a cause? Thanks, Marlen! It basically consumed much of my life a few weeks before the show, but it was a really great experience! And ahh that dress was my favorite, too! The designer is Anastasia Chatzka and she is fabulous! It also looks even more stunning in person! Amazing looks and amazing photos. One day I would love to attend these type of event. Oh. you are so lucky to be a part of something so beautiful and powerful. The pieces are so fresh and fun. Kudos to you! Wowww... Amazing show!!! Thanks for your lovely comment!!! FOLLOW you right now!!! Hope you like/follow my blog too!!! I'll be waiting for you!!! Cool to finally see some pictures! What was your part in the show? I know! Normalizing ethical and social responsibility in the fashion industry is one of the main goals of this blog as well as the show! Understanding that fashion does not have to be a destructive industry is really important! 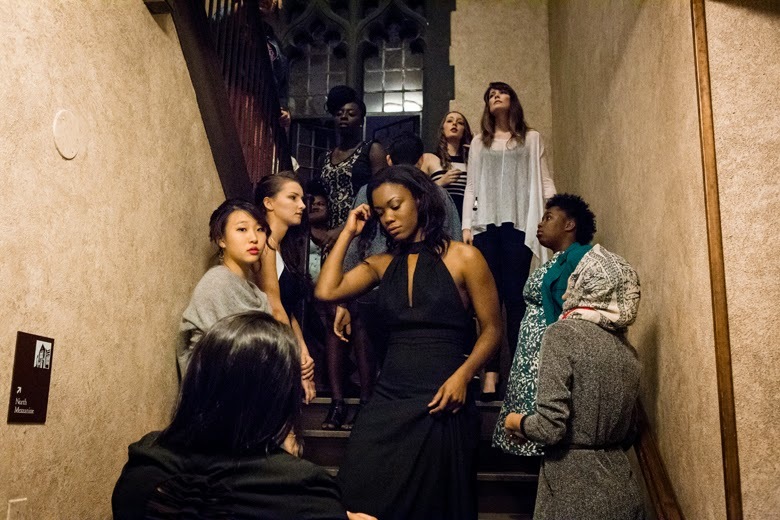 I was the "Fashion Director," meaning that I would pick and contact brands and put together looks from their collections, and dress the models. :) So of course, all of the ethical and local brands were on the top of my list to contact! That's awesome! What a great opportunity!